I first prepared oatmeal using steel cut oats a few weeks ago. I love the texture, but the few recipes that I tried did not have a lot of flavor. 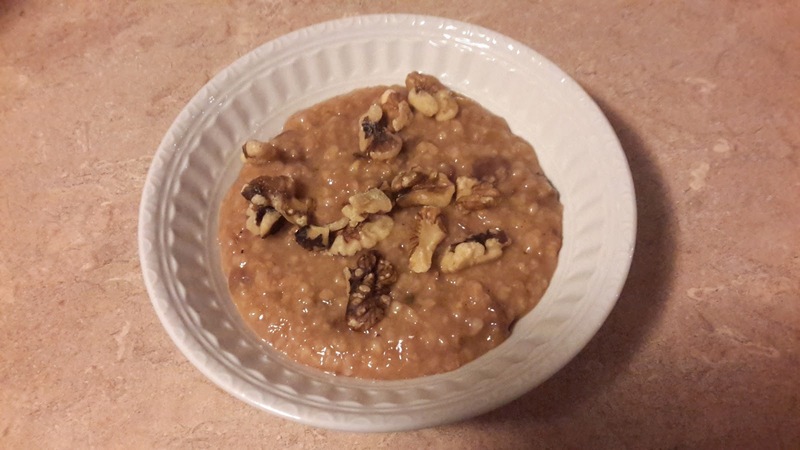 I like using my slow cooker so I can start the oatmeal before I go to bed, and have a hot breakfast ready for me when I wake up, and enough to last the rest of the week. I had a lot of apples and pears in my house this weekend so I made some apple pear butter, and then used it in this Apple Cranberry Crock Pot Oatmeal. I'm sure store bought apple butter would make the oatmeal taste just as good. This recipe produces about 8 cups of cooked oatmeal. If you don't have apple cider, replace it with an additional cup of water. Make sure to use the cooking spray so the oatmeal doesn't stick. I like to use Reynolds slow cooker liners, which makes cleanup easier. If using a slow cooker liner, place in slow cooker. Spray thoroughly with cooking spray. Place all remaining ingredients in slow cooker. Stir to combine. Cook on low for 7 hours, with the lid on. Remove lid. The oatmeal will appear very wet and loose. Stir for about 30 seconds, being sure to scrape along the edges. The texture will change to that of typical oatmeal. Top each serving with chopped walnuts, if desired.